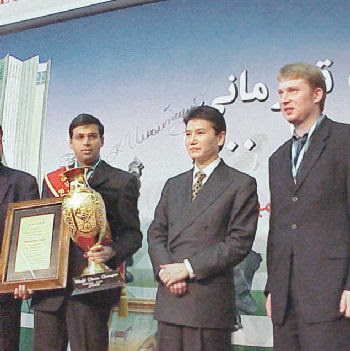 World Chess Championship 2000: Viswanathan Anand won the title for the first time after beating Spain's Alexei Shirov 3.5-0.5 in Tehran. He became the first Indian to win the title. However, Anand failed to keep his title in 2002 when he lost the semi-finals (tournament format) to Vassily Ivanchuk. The title eventually went to Ruslan Ponomariov thus making him the youngest world chess champion ever at the age of 18. Later, in 2005, Veselin Topalov became the FIDE World Chess Champion, 1/5 points ahead of Peter Svidler and Viswanathan Anand who both tied for second place with 8.5 points out of 14 rounds. This World Championship was hosted in New Delhi and Tehran. The first six games took place in India from November 27 to December 15. The final took place in Tehran from December 20 to December 24. World Chess Champion Anatoly Karpov criticised the format of the event and took FIDE to court! The title was, at this time split. So, both the recently-crowned Classical World Chess Champion Vladimir Kramnik and the previous World Champion Garry Kasparov (the World No. 1 at that time) did not take part. World Chess Champion in 2007: Mexico City hosted a double round-robin eight-player format from September 12-30 to decide the world champion. Anand won with a score of 9 out of 14 points which included four wins and 10 draws. He remained the only unbeaten player at the event. This World Chess Championship was unique because it was based on the tournament format instead of a match. The previous edition of the championship in 2005 had also been a round-robin event, but the title was split at that time with a Fide World Champion and a Classical World Champion. Classical champion Vladimir Kramnik refused to take part in 2005. Eventually, the 2007 tournament was to unify the title. Fide also decided that the world title from 2008 would be in match format. 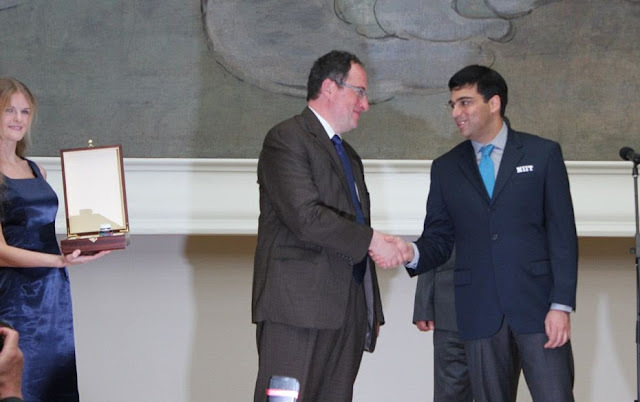 In 2000, when Anand had won the FIDE World Chess Championship, the rival 'Classical' World Chess Championship title held by Vladimir Kramnik of Russia. The title was eventually unified and Anand became, in 2007, the first undisputed World Chess Champion to have won the title from a tournament format since Mikhail Botvinnik had in 1948. Viswanathan Anand had said, in October 2007, that the double round-robin format was good and Kramnik's right to automatically challenge him was "ridiculous". 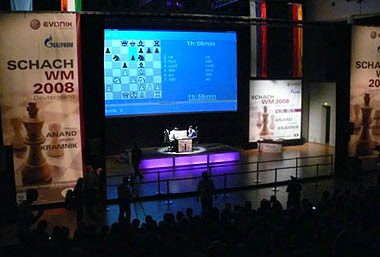 World Chess Championship 2008: The match format returned and Anand beat Kramnik in Bonn, Germany during a held from October 14–29. The rules required the first player to score 6.5 in 12 games to take the title. Anand amassed the points in 11 games which included three wins from the first six games. Two of these wins were with Black. Anand had a lead with 6–4 and required one draw from the last two games. World Chess Championship 2010: This match was versus Veselin Topalov in Sofia, Bulgaria. Anand and his team had a tough time even getting to the venue. The Frankfurt-Sofia flight on April 16 was cancelled due to the ash from volcano Eyjafjallajökull. The entire Europe was hit. 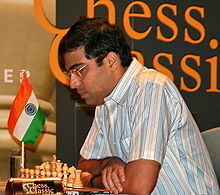 Anand wanted a three-day extension, but the Bulgarian organisers refused. Anand still made it to Sofia on April 20 logging a 40-hour by-road journey! The match began a day later than scheduled. The World Chess Championship 2010 included 12 games. The score was tied with 5.5 each after 11 games. Anand went on to win the 12th game with Black and retained his title. How Veselin Topalov came to be the challenger in this match is a story by itself. Fide, attempting to unify the title, announced that the World Chess Championship 2007 would be an eight-player tournament including the 2005 FIDE World Chess Champion, but not the Classical World Chess Champion. Later, a so-called 'unification match' was organised between Topalov and Kramnik (2006 World Title Event). Kramnik won and Topalov could not qualify for the 2007 World Championship. However, in June 2007, FIDE decided to announce "compensation" for Topalov in the form of privileges to Topalov allowing him to take part in the 2009 qualification cycle giving him direct entry into the Challenger's match. Topalov took on Gata Kamsky for this Challenger's match as the latter had won the Chess World Cup 2007. Thereafter, Topalov beat Kamsky and became Anand's challenger in Sofia..
World Chess Championship 2012: Viswanathan Anand defended his title next in at the Tretyakov Gallery in Moscow. He took on Boris Gelfand who had earned the right to challenge him by winning the Candidates Matches 2011. The match went to a tie after 12 games with six points each. Both had one win each and the other games had been drawn. 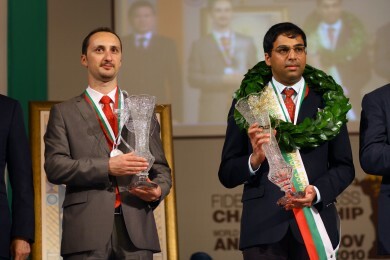 Anand retained his title by winning the rapid tiebreak by 2.5–1.5. Anand had lost the 7th game, but returned to beat Gelfand in the 8th game in 17 moves – making it the shortest game in any World Chess Championship ever.